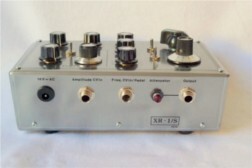 The frequency of the XR22 VCO is controlled by two independent frequency control sections F1 and F2 with two independent manual frequency controls and CV inputs; either one or the other of these routes can be activated by a logic signal applied on socket „FSKin“ and/or by switch „FSK“. b) In the low position of switch „FSK“ the FSK input is connected to the VCO’s own squarewave output and the oscillator frequency-shifts itself. Now the oscillator produces ramp or sawtooth waves on its sine/triangle output and pulse waves on its squarewave output. 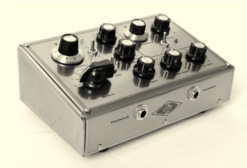 Rising and falling edges of the ramp wave and pulse/pause times of the squarewave can be adjusted independently with knobs F1 and F2, the octave switches and/or by CV inputs. 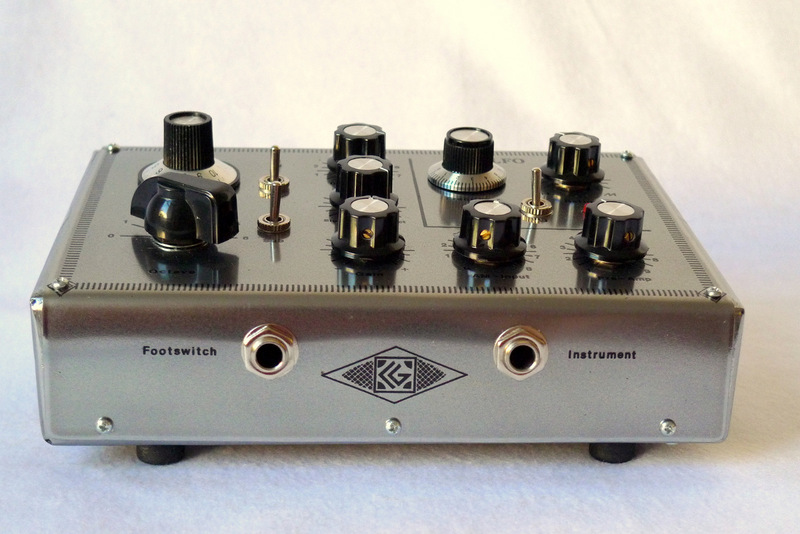 With this switch in upper position, both frequency routes F1 and F2 (with its frequency knobs, octave switches and CVins) work complete independently. 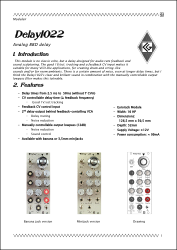 In its lower position, knob „F1/com“ and sockets „CVin F1/com“ and „CVin F1/com 1V/oct.“ work for both routes F1 and F2. 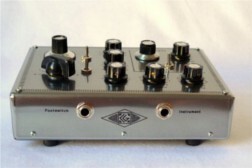 Now, when adjusting frequency with knob „F1/com“ the knob works for both routes and the ratio between F1 and F2 remains the same. 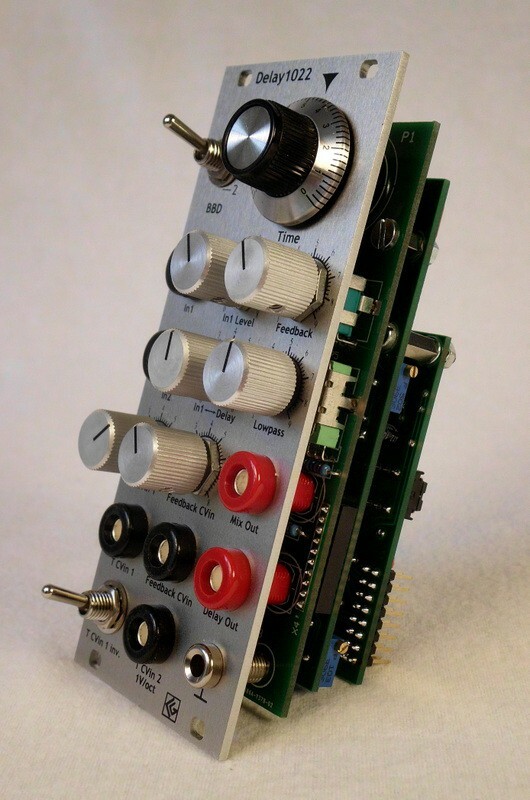 An applied control voltage to the respective CV inputs „CV1/com“ and/or „CV1/com 1V/oct.“ works also for both frequency routes F1 and F2; ensuring 1V/oct tracking when using both frequency routes within the FSK option. 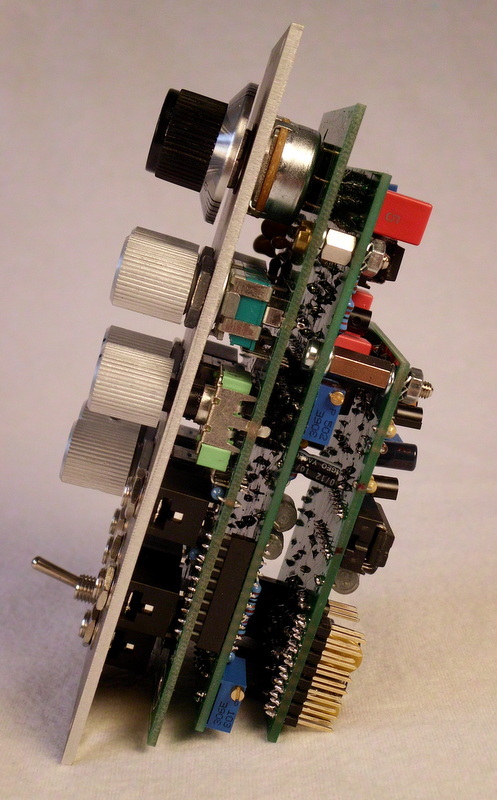 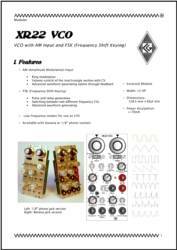 This module is no classic echo, but a delay designed for audio rate feedback and sound sculpturing. The 1V/oct. tracking and a feedback CV input makes it suitable for many VCO-like applications, for creating drum and string -like sounds and/or for room ambience. 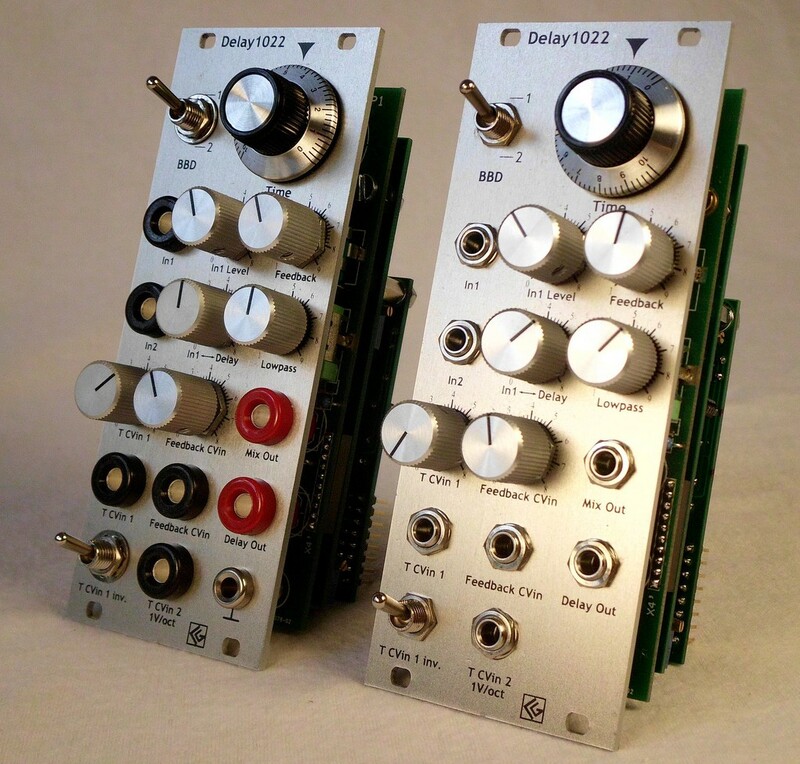 There is a certain amount of noise, as to be expected from analog BBD delay modules, however the Delay1022’s clear and brillant sound in combination with the manually controllable output low pass filter makes this completely tolerable. 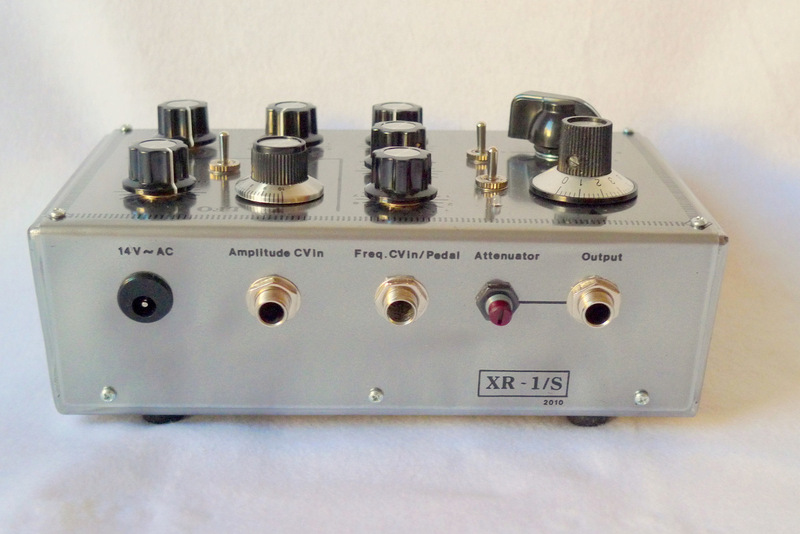 XR1-S is a ring modulator desktop unit with integrated oscillator and pre-amp, specially designed for instrumentalists who like the special sound of ring modulation. 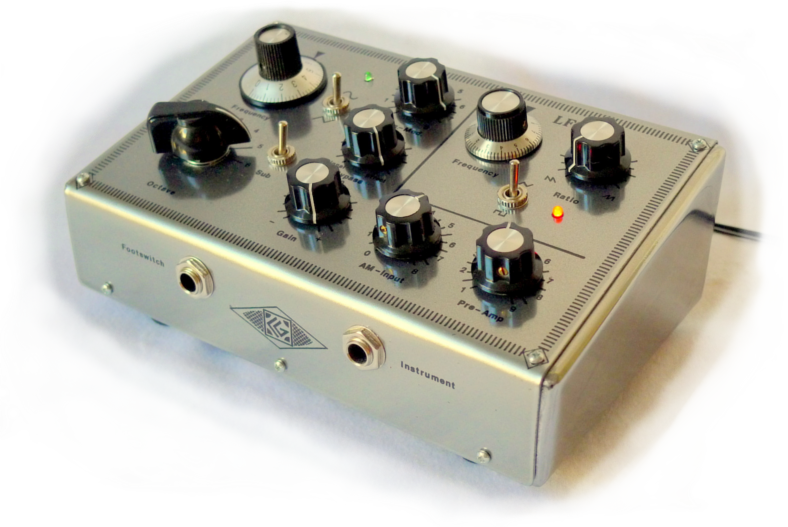 Also it is suitable as part of an analog synthesizer equipment. 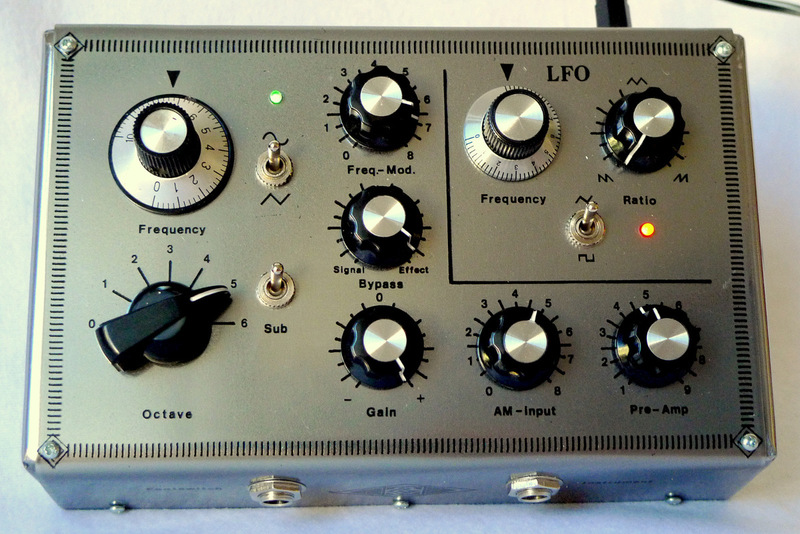 The internal LFO (with adjustable waveform symmetry) may be used to modulate oscillator frequency , as well as this can be modulated by an external CV Signal. 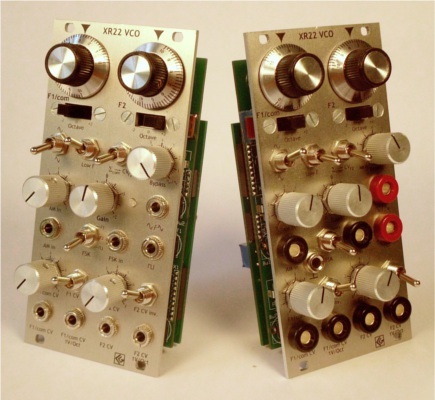 There is a second AM input, which is DC-coupled and which allowes you to add an external control voltage (like from sequencer) for volume control of the VCO. 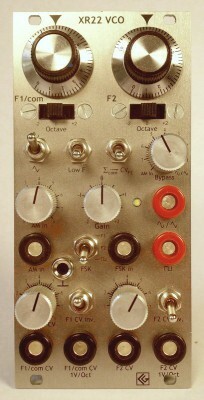 The modulation oscillator frequency may be variied step by step with the „octave“ switch and tuned with the „frequency“ poti. 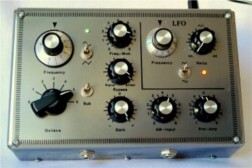 Also there is a „sub“ switch shifting the generator into very low frequency areas.